Declaring oneself a fan of Les Légions Noires would be difficult enough if the group’s various releases were easy to find, let alone if one actually enjoyed the raw, violent assault of the music. Perhaps the best known and easiest to find of them all is Mütiilation, the project of William Roussell, better known as Meyhna’ch. It’s a tricky project to get to grips with given the sheer amount of obfuscation, from claims that Meyhna’ch had died with the release of this compilation due to the sheer awfulness of ‘modern’ black metal, to persistent vampiric rumours not helped by his ancestral home apparently being an ancient castle. The fact that he didn’t record this album with a microphone inside a dead rat, as others are alleged to have done, puts Meyhna’ch on the mainstream wing of LLN, not that there’s anything remotely mainstream about this. Despite eventually being expelled from LLN for alleged heroin addiction, Mütiilation sums up the group’s sound perfectly for me. Raw, miserable, occult and chillingly atmospheric, the vampirism references are not the gothic campness of Cradle Of Filth or the teen angst of Twilight, but more along the Nosferatu line; disgusting, pathetic rodentlike creatures that live in damp shadows, the walking dead creating anthems of bleak despair. Of course, the aforementioned heroin addiction suggests that Meyhna’ch suffered from a vampirism of a different sort, and whether you view this as the deranged shrieks of a vampire or the self-loathing despair of a junkie – or both – it’s tremendously effective. Remains Of A Ruined, Dead, Cursed Soul is gathered from several sources, the unreleased album Evil: The Gestalt Of Abomination originally due 1993, and two tracks recorded in 1996. It opens with ghastly moaning and clattering percussion, building as a single deranged guitar tone rings out, ending in near ambience – rather like Captain Beefheart having a nervous breakdown. From then, with To The Memory Of The Dark Countess onwards, things will be more recognisable to fans of depressive black metal like Xasthur, although this is many times less serene. Raw, primitive percussion, a wall of guitar noise, and tormented shrieks and wails from Meyhna’ch make up the ‘music’ here, but it’s incredibly effective in atmospheric terms. Possessed And Immortal features even more disturbing vocals, almost clean moans turning to spinechilling shrieks, and the slower-paced Travels To Sadness, Hate And Depression does exactly as the title suggests. 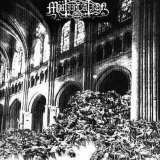 Mütiilation may not always have been the most respectable and serious black metal project; I refuse to believe that there’s not some dark humour at work from looking at the cover art for Black Millenium (Grimly Reborn) or Majestas Leprosus. Yet the earlier work is genuinely eerie and disturbing, the darkness at its most tangible here even on the added, later tracks, which ironically are even rawer. The Fear That Freeze is an early Mayhem-esque clatter that could have fit on De Mysteriis Dom Sathanas, and Holocaust In Mourning Dawn is a very low-fi rumble with sinister vocals on the top. Neither are ultimately as good as the album that would have been Evil: The Gestalt Of Abomination, however, and it’s that piece of lost madness that here receives the kudos.